Leading clean emissions bike teams MotoCzysz and Mugen are again set to go head to head in the 2013 SES TT Zero Race on the Isle of Man. Both teams broke the 100mph average speed barrier around the TT Mountain Course in 2012 with the Japanese outfit Mugen splitting the MotoCzysz pair, with all three podium placed riders posting times in excess of 100mph. 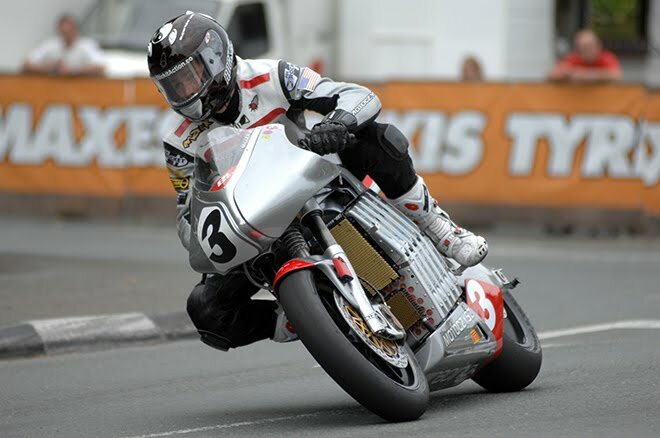 Michael Rutter took the honours in 2012 with the first ever 100mph lap recorded by an electric bike, defending the title he won in 2011, but he was chased all the way by John McGuinness's Mugen who finished with a time of 102.2pmh, 23 seconds behind with 2010 SES TT Zero champion Mark Miller a further 15 seconds back in third place. Rutter gets the prestigious number 1 draw and will be first away on the road, followed by his teammate Mark Miller. MotoCzysz return with their new 013 e1pc and are looking to achieve a sub 20:34.8 lap which would give them an average lap speed in excess of 110mph, a time that would make them competitive in the conventional 650cc Supertwin class for petrol powered machines. Nineteen time TT champion John McGuinness will again spearhead the Mugen effort, and will carry the same number 3 plate that he has in the conventional classes. The 'Mugen Shinden Ni', their 2013 machine, features an all new chassis and power train as well as completely new bodywork. The team, which made its debut in the race in 2012, has been carrying out a series of wind tunnel and engine bench testing programmes as well as track sessions and has targeted a lap in excess of 110mph. Six countries will be represented in the 2013 SES TT Zero with ManTTx and local rider Dave Moffitt representing the Isle of Man, Italian outfit Vercamoto and Chris McGahan and last year's debutant competitors Komatti-Mirai Racing Team from Japan with Japanese national Yoshinari Matsushita. USA based Lighting also return after missing the 2011 meeting. University outfit Kingston, which has competed in every event since the electric bike inception in 2009 and won the University prize in 2011 as well as finishing on the podium that year, will again campaign their 'Ion Horse' machine. The university outfit went close to the 100mph time in last year's qualifying session but ultimately ran out of power just 800 metres short of the finish line. George Spence will again represent the University outfit. A strong University entry also sees Brunel returning to the race in 2013 with Welsh rider Paul Owen. Other University outfits include 'Buckeye Current' from Ohio State University with 2009 Race winner Rob Barber and Imperial College who will be represented by Spain's Antonio Maeso. "SES is delighted to once again support the SES TT Zero Race. As a company we pride ourselves on innovation and groundbreaking technology and it's clear that there is going to be real competition at the front of the field again in 2013. Whatever the result, all the teams can be proud of their efforts as it's a real achievement just to get a bike on the starting grid."